The recreation center "Caravel" is located in an ecologically clean area on the Azov Sea, at the beginning of the Spit Peresyp. The territory of the recreation center is greened, there is a park area for recreation. 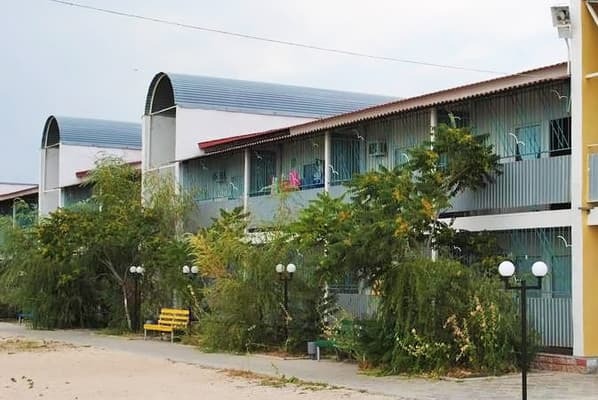 The base "Caravel" offers accommodation in wooden and brick houses, in which there are 2, 3, 4-bed rooms of the following classes: 1 category +, 1 category, 2 category and 3 category. The recreation center "Karavella" provides three meals a day in its own dining room, the use of the amenities of the recreation center, as well as security. 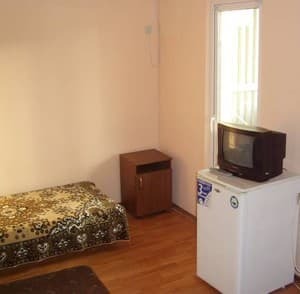 In the rooms for living there is everything that is necessary for a full life and relaxation - a shower (hot and cold water), a toilet, a refrigerator, air conditioning and so on. In the adjoining territory there are recreation areas for the houses. For younger guests there is a children's playground. Those who wish to cook shish kebab can do it in a specially designated place. Recreation center "Caravel" has its own beach. The distance to Melitopol is 64 km. 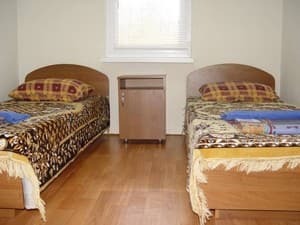 Description of the room: One-room double room has a double or single beds, bedside table, hanger, table, chairs. A bathroom for two rooms, cold and hot water. 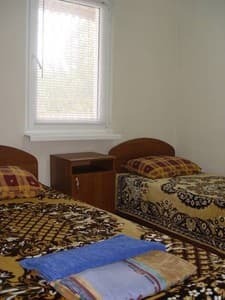 Description of the room: One-room 3-bed room with a double and single bed, bedside table, hanger, table, chairs. A bathroom for two rooms. 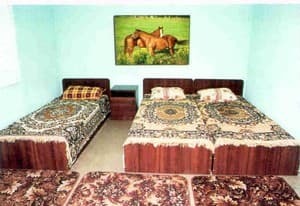 Description of the room: The room has a double or single beds, bedside table, chairs, wardrobe, mirror, also there is a sofa for extra bed. Description of the room: One room with a double and single bed, bedside table, chairs, wardrobe, mirror. 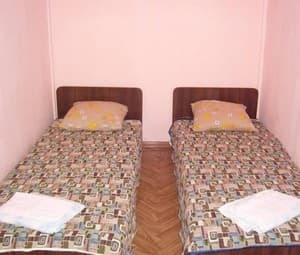 Description of the room: Two-room suite with a double bed and a single bed, includes the possibility of placing on an extra bed. We offer a comprehensive 3 meals a day in the dining room in the recreation center "Caravel", a large selection of drinks and dishes. There is a cozy cafe on the beach. Recreation center "Caravel" is located at the beginning of the Spit Peresyp. The distance to Melitopol is 64 km. When choosing the way by train it is necessary to purchase a ticket to: Dnepropetrovsk, Zaporozhye or Melitopol. From each of the above cities in the summer, shuttle buses run to the bus station. Kirillovka, from the bus station approximately every 15-25 minutes to the spit Peresyp.